SilverFast has a very complete color management system, It allows to manage color options related to your files and how these will be interpreted by the machine and different devices (as explained in this previous post). If you plan to scan your pictures to archive or for post-editing an embedded profile will help the editing application interpret the colors of your files correctly . SilverFast Ai also embeds the scanner profile into HDR and HDRi files for automation of certain tasks in SilverFast HDR Studio. To embed a Color profile make sure the box is checked in SilverFast options and that you select the profile to be embedded (which should be the one used by your system). In this case the AdobeRGB1998.icc profile will be embedded in the previous case. 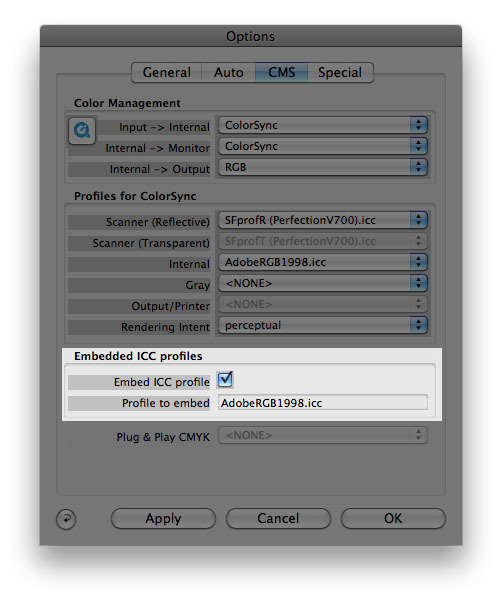 If the editing application is color management capable, the profile will allow the application to correctly color match the files. Best Regards and happy color managing your pictures with SilverFast!